Can ionic liquids revolutionise sustainable polymers? Our Department provides excellent opportunities for academic teaching and research collaborations with other departments, such as Education, Psychology, Social & Policy Science, Biology & Biochemistry and Pharmacy & Pharmacology. We also have a range of specialist equipment. Our postgraduate teaching and research courses now form part of the Faculty of Humanities & Social Sciences Graduate School. The Graduate School can provide you with dedicated support and a strong community in which to base your studies, whether on campus or by distance-learning. -To provide excellent teaching in a stimulating learning environment designed to maximise student attainment and graduate employment prospects. 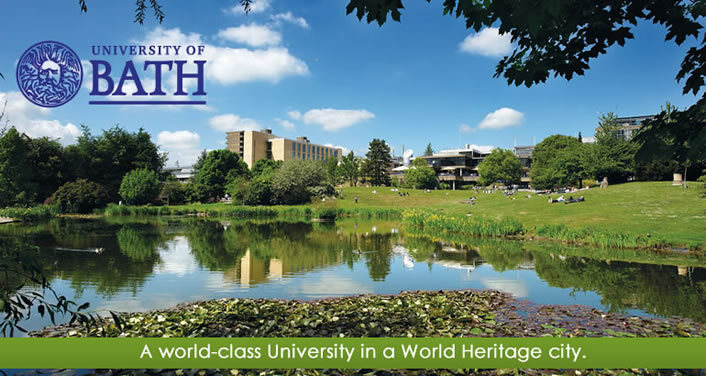 The Department for Health was first established within the University of Bath in 2003. The Department was devised to centralise the high profile research and teaching in the health-related disciplines already taking place throughout the University, creating a single entity through which links with the health sector at national and international levels can be channelled, co-ordinated and developed. Our MPhil and PhD courses combine taught research training and applied research practice for a fully rounded student experience. You can choose between applying for a pre-defined research project and developing your own proposal. We offer a range of studentship and scholarship opportunities all year round. Collaborative research is at the heart of our joint Architecture & Civil Engineering Department. You will join us as a junior academic colleague and contribute to forward-thinking research in one of our interdisciplinary centres/units. You could also join our Centre for Doctoral Training in the Decarbonisation of the Built Environment (dCarb). The centre is endorsed by the EPSRC and offers students the chance to study on an innovative three-year doctoral programme that focuses on low-carbon technologies. Our department is dedicated to advancing research that deals with the challenges our built environment faces such as climate change, sustainability and low-carbon design. Our international impact was officially recognised in the 2014 Research Excellence Framework (REF). Our research was ranked joint 1st in the Architecture, Built Environment and Planning unit of assessment. 90% of our research activity was graded as either world leading or internationally excellent. Is building-integrated energy storage a good idea? The Department of Biology and Biochemistry is a dynamic and ambitious Department with 47 academic staff, 58 postdoctoral researchers, 81 graduate students and 54 support staff. The Department is one of the largest and most successful in the University and is firmly committed to excellence both in research and teaching. The Department has adopted an integrated approach embracing the view that tomorrow's breakthroughs are likely to occur at the interfaces of traditional biological subdivisions. It was recently placed 5th in a national league table for Biological Sciences, compiled by Times 2005. Current research grants are valued at over £16 million, the Department scored a top grade 5 in both the 1996 and the 2001 national Research Assessment Exercises and a maximum of 24 points in the 1999 national Teaching Quality Assurance review. The department is an EU Marie Curie Training Site for the Postgenomic Analysis of Microbial Virulence and an EU Marie Curie Training Site for Early Stage Researchers in Regenerative Medicine. If you identify a specific project, research area or an academic that they would be interested in working with, please contact the Department’s Postgraduate Administrator, Dr Emma Lawrence ([email protected]) for further information. The Department is also part of the Centre for Regenerative Medicine, which currently has a number of Marie Curie Visiting Fellow Scholarships available for EU and Overseas students. For further information on these scholarships, together with the PhD projects available, please see www.bath.ac.uk/crm/MCEST/index.html, or contact Dr Emma Lawrence ([email protected]). Our MPhil and PhD courses combine taught research training and applied research practice. You can choose between applying for a pre-defined research project and developing your own proposal. We welcome applicants ready to undertake high-quality academic research in chemical engineering. You will join us as a junior academic colleague and contribute to forward-thinking research in one of our multidisciplinary centres/units. Our international impact was officially recognised in the 2014 Research Excellence Framework (REF). Our Department's research ranks in the top ten, with 89% deemed world leading or internationally excellent. The department of Chemistry at Bath is a highly successful and expanding department. A new research building (opened in 2000) and teaching building (opened in 2003) plus state of the art laboratories and equipment make Bath a first choice for many people looking to pursue graduate studies in the general area of Chemistry in the U.K. Currently, there are 24 full time, fully research active members of staff. We are a young department – the average age of academic staff is just 37! Current there are over 60 postgraduate students, but this number is set to greatly expand in the coming years. Areas of specific expertise include: asymmetric synthesis, development of new chiral catalysts, electrochemistry, solar-cell research, biological chemistry, biophysical chemistry, polymers, X-ray crystallography, chemical education research to name but a few key areas. There are generally more than 16 postgraduate studentships available per year for students wishing to pursue Ph.D. degrees. It should also be noted that strong collaborative links exists between other departments in the University (including Biology and Biochemistry, Pharmacy, Physics, Chemical Engineering) and other academic intuitions world-wide. We are always on the look out for bright, highly motivated students to do research at Bath. We are currently ranked 8th in the UK for economics in the Complete University Guide 2017. Our graduates have excellent career prospects including leading finance, higher education and governmental institutions. Part of this success is based on our exceptional placement programme. We offer various undergraduate, postgraduate and research degrees which enjoy an excellent reputation in both the private and public sector and in academia. We are contributing to various large-scale international funded research projects including GLAMURS, Econadapt and Nudge-it. Our research has a widespread impact on society which is documented through numerous impact cases. Our department is a thriving academic community focused on furthering our understanding of policy, culture, pedagogy and diversity within a global educational context. We hold a strong national and international reputation for our research. We have an excellent network with a wide range of educational institutions including, schools, colleges, universities, local authorities and government departments, within the UK and also internationally. We currently host around 40 academic and research staff, and have over 170 students enrolled on our doctoral programmes studying and researching both on campus and via distance learning throughout the world. Our MPhil and PhD courses combine taught research training and applied research practice for a fully rounded student experience. You can choose to apply for a pre-defined research project or develop your own proposal. We encourage a wide range of interests and our academic staff are open to new ideas in their existing areas of research expertise. You will join us as a junior academic colleague and contribute to forward-thinking research in one of our interdisciplinary centres. Our international impact was officially recognised in the 2014 Research Excellence Framework (REF). 91% of our research activity was graded as either world-leading or internationally excellent. The Department of Mathematical Sciences is an integrated department, whose work in the three areas of Pure Mathematics, Applied Mathematics and Statistics has an international reputation. In the 2001 Research Assessment Exercise, Applied Mathematics was rated 5* with Pure Mathematics and Statistics rated 5. The Department was placed 8th for Mathematics and Statistics in the ‘Good University Guide’ published by The Times (2007), with the University placed 9th overall. We were one of only two departments in the country to achieve the top score of 24/24 in the Teaching Quality Assessment. Staff in all three areas are involved in a very wide range of national and international research activities and several members of the Department have won prestigious prizes, medals and research fellowships for their work. All parts of the Department welcome research students (both full-time and part-time) working towards the degrees of PhD, Integrated PhD and MPhil. With 18 Professors and 30 other academic staff, a wide range of research topics can be supported in depth and students with a good honours degree, or equivalent, will find much to enrich their scientific interests. Research in the Department covers a wide spectrum from the very pure to rather more applied aspects of Mathematics and Statistics. Some research is of a fundamental theoretical nature while much of the more applied work involves collaboration with other departments in the University, with industry and technology, and with government research departments. Each of the research groups within the Department runs regular seminar programmes. A major new complex systems initiative started in 2005. Main areas of research specialisms: Algebra and Geometry, Analysis, Control Theory, Differential Equations, Industrial Applied Mathematics, Mathematical Biology, Numerical Analysis, Solid Mechanics, Brownian Motion, Stochastic Processes, Mathematical Finance, Medical Statistics and Epidemiology, Environmental Statistics, Multivariate Analysis, Computational Statistics, Bayesian Modelling. Facilities and equipment: A comprehensive network of around 300 computers. International and industrial links: The Department has many close links with industry, especially through the Industrial Applied Mathematics group. We have joint research projects or other links with with mathematicians in Canada, the USA, Japan, most European countries and several others worldwide. Careers information: Recent PhD graduates have been in demand for academic posts, both in the UK and overseas, as well as for posts in industry. Our MPhil and PhD courses combine taught research training and applied research practice for a fully rounded student experience. You can choose to apply for a pre-defined research project or develop your own proposal. We encourage a wide range of interests and our academic staff are open to new ideas in their existing areas of research expertise. We offer a range of studentship and scholarship opportunities all year round. You will join us as a junior academic colleague and contribute to forward-thinking research in one of our interdisciplinary centres/units. We are dedicated to working with industry to find solutions to problems that affect all areas of society. Our research impact was officially recognised in the 2014 Research Excellence Framework (REF). 89% of our research was graded as either world-leading or internationally excellent, placing us 10th in the UK for our submission to the Aeronautical, Mechanical, Chemical and Manufacturing Engineering. Digital Hydraulic System Control - investigating novel digital switched hydraulic converters and their feasibility via analytical modelling and experimental validation. High Order CFD of secondary air system in turbines. The Department of Pharmacy and Pharmacology is engaged in research of exceptional international standing. In the 2014 Research Assessment Framework we had 91% of our research rated as world-leading and internationally excellent, Our approach to drug discovery and translational science is attested to by the outstanding rating for the environment with 100% scored as world-leading and internationally excellent in terms of vitality and sustainability. Our internationally recognised expertise in translational pharmaceutical and pharmacological sciences interfaces with clinical research in psychology and health. We provide a broad platform for cutting-edge research and is committed to maintaining its position of international excellence. The Department is organised into four groups: Medicinal Chemistry, Pharmacology, Pharmaceutics and Clinical Pharmacy/Pharmacy Practice. This structure allows for focussed as well as interdisciplinary research within the Department as well as collaborative projects with the pharmaceutical industry and healthcare providers. Postgraduates have the opportunity to work on projects ranging from fundamental aspects of drug discovery, action and development to applied areas that are closer to healthcare delivery. Currently, there are more than 50 research postgraduates and 40 post-doctoral research officers working in the Department. •	Astrophysics: Advanced ground and space-based technology is exploited to collect cosmic signals from distant objects and use this information to study the structure, dynamics and evolution of galaxies, the physics of star formation, the role of black holes in galactic evolution, accretion (how matter comes together in space) and the role of cosmic magnetic fields in harnessing the energy of spinning black holes. •	Nanoscience: Innovative atomic-scale characterisation tools are used for the manipulation and design of novel functional materials on the nanoscale. Techniques embrace low temperature UHV scanning probe microscopy, x-ray synchrotron and neutron scattering, while facilities include the Graphene Centre and the David Bullett Nanofabrication Laboratory. Research encompasses the structural, transport, magnetic and superconducting properties of condensed matter at the nanoscale, including the interaction between electrons and photons in semiconductor and metallic systems. •	Photonics: The Centre for Photonics & Photonic Materials (CPPM) leads a major international effort in the field of linear and nonlinear photonics and optoelectronics, particularly in the context of novel and microstructured fibres. It benefits from an outstanding international reputation for its work on the optics of micro-structured materials, in particular the photonic crystal fibre (PCF) which was pioneered in Bath. •	Theoretical and Computational Physics: Computational and theoretical methods are being spearheaded to bridge the behaviour of complex systems on multiple length and time scales. Many projects benefit from access to Balena, the University’s high performance computing cluster with over 3000 CPU cores. Research spans the condensed matter/optical physics spectrum and embraces the electronic and nanoscale properties of surfaces, photonic crystals, nanomagnetism, charge transport in optoelectronic devices, soft matter and biophysics, and network theory as applied to animal behaviour. Politics, Languages & International Studies (PoLIS) is one of the largest departments in the University. Our students are ambitious and highly committed leaders of the future who are preparing for careers in international politics, business and communication. Many staff are leading scholars in their field and are involved in a wide range of research activities, including collaborative projects at both national and international levels. We deliver a range of highly successful courses in politics and languages at both undergraduate and postgraduate levels. French, German, Italian, Russian and Spanish languages are offered on our undergraduate courses. Students of the MA Interpreting & Translating may also study Chinese. We have an excellent reputation for teaching and students who study with us will benefit from our supportive learning environment. The quality of our work has been recognised by the Research Excellence Framework (REF2014) as over two thirds of our publications and 100% of our departmental impact submission was judged to be outstanding (4*) or very considerable (3*). The Department of Psychology has a distinctive research profile with a cutting edge approach to theory, methodology and application. We came into formal existence in 1997 when the University was re-organised into faculties - prior to that we had a flourishing undergraduate and postgraduate programme within the School of Social Sciences. All academic staff in the Department are actively engaged in research and publication. We have a strong tradition of interdisciplinary work and collaborate with other departments in the University of Bath, local and national institutions, and international networks. The Department has doubled in size over the last five years and we now have 30 students undertaking postgraduate research. Twenty academic staff are augmented by various researchers and research fellows. Bath is one of the ten best places to study in the United Kingdom. We have an excellent tradition of obtaining funds from the UK's various research councils and charities and we have strong links with various industrial partners and European agencies. Other sources of income reflect our ties with the various education and health authorities, the Home Office and charities. £1,191,435 from the EPSRC and £369,245 from industry to Dr Danae Stanton Fraser for the CITYWARE project under the WINES Programme (Wired and Wireless Intelligent Networked Systems). Partners include Computer Science (lead) and Psychology at the University of Bath, Imperial, Bartlett Institute, Vodaphone and IBM. The Department of Social & Policy Sciences is an internationally-recognised research-intensive Department with a strong focus on policy and practice and a commitment to contribute to social well-being and social justice. We draw together academic staff with backgrounds in Social Policy, Sociology, Social Work and International Development and work closely with colleagues in Psychology, Economics and Health. The Department has approximately 40 Mphil/PhD research students in Social Policy, Sociology, and Social Work. Bath has been a leading UK centre for research and postgraduate study in development studies for more than thirty years. It aims to contribute to combating global poverty and injustice by combining primary research into the reality of global poverty and inequality with critical engagement in development practice and policy making. It includes staff in economics, sociology, social anthropology, politics and human geography. CDS is concerned with development in an interconnected world, with ongoing research activities in Latin America, Sub-Saharan Africa, the Middle East, South and South East Asia. Themes include: poverty and policy; wellbeing and collective action; markets and microfinance; gender, youth and childhood; religion and identity; conflict and natural resources. We have around 30 MPhil/PhD students in International Development. For a list of current students and projects, see http://www.bath.ac.uk/soc-pol/postgraduate/phd/phd-list.html. For further information on current projects see http://www.bath.ac.uk/cds/research/projects-activities.html. The School of Management is one of the UK's leading business schools. Currently ranked 1st for Student Satisfaction in Business Studies (National Student Survey) and 1st for Accounting and Finance (The Times and Sunday Times), we are a leading centre for management research - placed 5th in the UK in the latest RAE. We have an excellent reputation for the quality of our research which covers all areas of management. Research is structured around issue-based, multi-disciplinary groups and a number of industry-funded research centres and projects exist within the School.